We are committed to providing our consumer with high quality and cost-effective products. Your purchase is protected by us, and any issue please contact us freely, we are always glad to help! SEEHONOR Waterproof Business Laptop Backpack offers generous storage capacity. Lightweight and water resistant durable material, make it suitable for men or women as a fashion business backpack, travel bags, school backpack. Multi-Compartment Design: Big capacity with multi compartmens design make our bags meet all your reuqirements, provides a separated space for your laptop, ipad, books, phone, keys, clothes, bottle and more. Easy access to what you want. 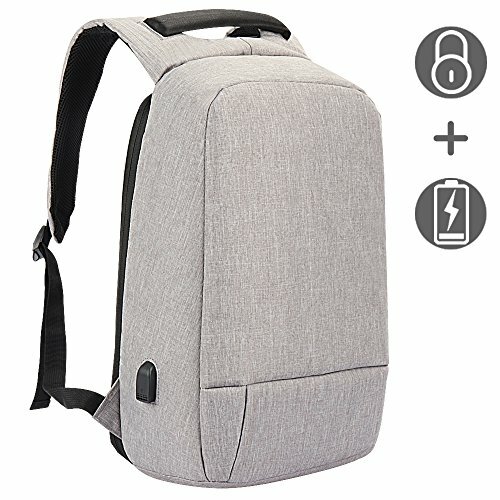 USB Charging Port: With an external USB charging port and a built in charging cable inside, this computer backpack offers you a more convenient way to charge your devices while walking. Please noted that this backpack doesn't include power itself. Lightweight & Waterproof: The travel laptop backpack is made with durable, water resistant polyester to withstand heavy use. Contoured shoulder straps with mesh fabric and adjustable side compression straps. Padded back panel with Airflow ventilation technology for added support and comfort. Our backpack is LIGHTWEITHT for daily use for women, men, college, school students. This slim business laptop bag fits to all laptops under 17 Inch. 12 X 6 X 17.7 inch with dedicated computer compartment protect your laptop perfectly, such as Lenovo, Samsung, MacBook, Dell HP etc. If you have any questions about this product by SEEHONOR, contact us by completing and submitting the form below. If you are looking for a specif part number, please include it with your message.